The church under the invocation of St Michael Archangel erected in 1614 of mortise and tenon construction on a stony foundation. The church’s architectural points of interest are: a square tower of post construction with a splendid dome (built in 1730), the ceiling in the nave centre is based on a centrally raised post and also portals with transoms in the shape of donkey back. Particular attention should be paid to the wall paintings in the presbytery and in the parts of the naves. You cannot miss the late baroque altar from 1765 (with a relief of Holy Trinity), the pulpit from 1716 and the baptismal font from 1731. The church, picturesquely situated on a little hill on the banks of Michalice artificial lake, is especially worth seeing after dusk. At that time, wonderfully lit, it looks really splendidly surrounded by the park. The church under the invocation of Blessed Mother of Częstochowa possesses magnificent baroque altar from the first half of the 18th century decorated with a painting of the Blessed Mother. The pulpit also comes from the same period, however the church bell is dated to 1657. The church being of half-timbered wall filled bricks construction (with a tower of post construction) was erected in 1620. 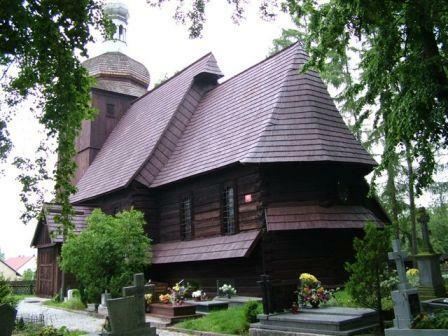 The wooden and brick church under the invocation of Holy Trinity was erected at the beginning of the 15th century. The side altar was built between 1510 and 1520, the main altar, a bit newer (late baroque) shows the coronation of the Blessed Mother among clouds. The richly decorated pulpit of late renaissance from 1620 and polychromed epitaphs from the beginning of the 17th century are also worth mentioning. 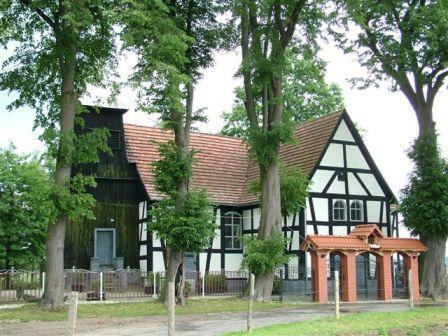 The church under the invocation of the Virgin Mary in Biestrzykowice unfortunately is no longer a wooden church. After the tragic fire it was carefully rebuilt at the beginning of the 90s of the previous century, however unfortunately not of wood but of brick. The fire consumed the magnificent 17th century pulpit and baptismal font from the beginning of the 18th century. The parish church in Woskowice Małe under the invocation of St Lorenzo was erected in 1711. The nave and the tower were built of wood but they have different construction. The nave – mortise and tenon and the tower – post construction. The most significant monuments inside the church are new baroque wall paintings and rich interior equipment: the pulpit, baptismal font and sculptures of the saints from the 18th and 19th centuries. In the west part of the village there is a filial church under the invocation of the Holy Cross. 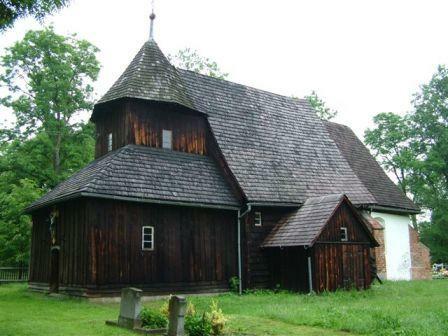 Erected in the 17th century it has mortise and tenon construction. Quite exceptional is the altar in a shape of triptych depicting the crucifixion of Christ from 1603. Moreover, the baroque sculptures of the Blessed Mother and St John the Evangelist and also the cross and two empire candlesticks are of great antique value.